I decided recently to add a battalion of Portuguese Caçadores to my Portuguese contingent of Wellington's army, light troops that fought with distinction alongside the British throughout the Peninsular campaign. There are not many good sets of these available in 1/72. 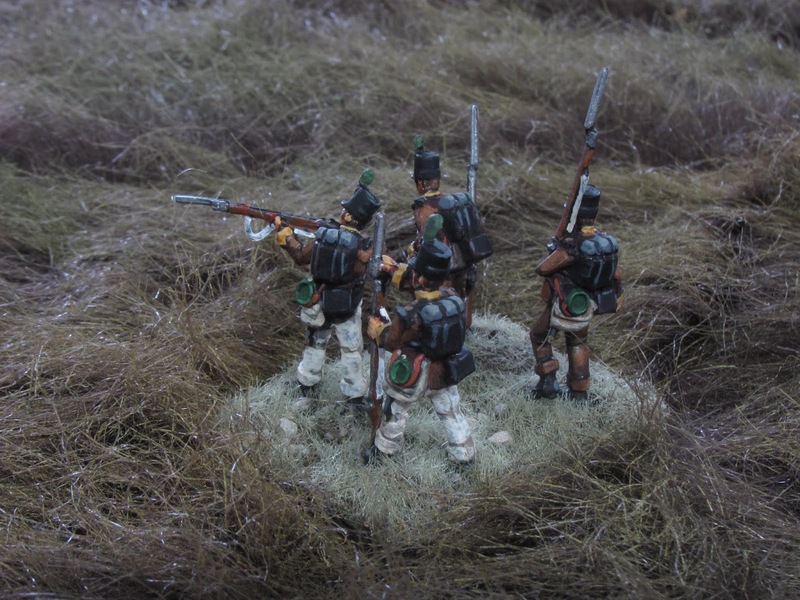 Emhar makes a set of Caçadores and infantry mixed, but I find the poses a bit stiff, the detail too lightly defined and the Caçadores in this set wear the earlier shako, similar to the British Belgic shako, which was quickly replaced with the stovepipe. 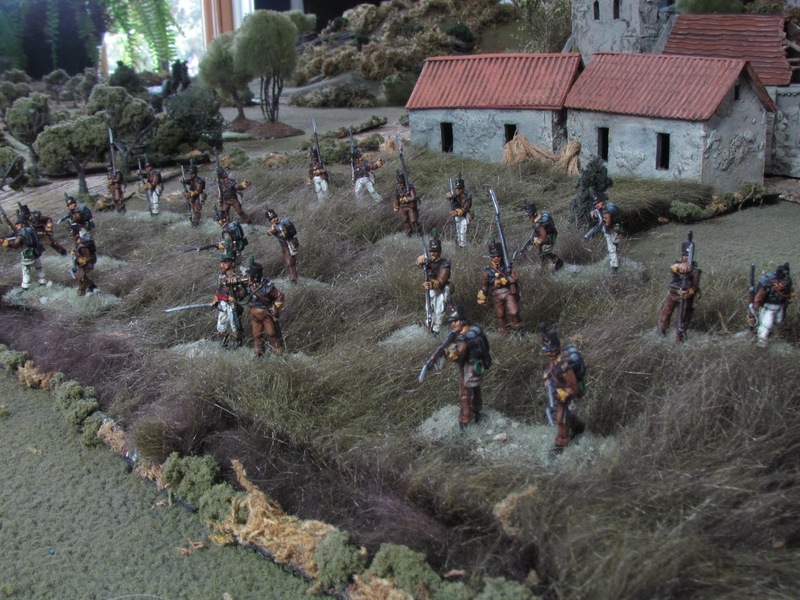 There are some very fine Caçadore metal figures available through Hagen (from whom I purchased my Portuguese line infantry) but I needed them sooner than a trans-Atlantic order would take. So I took a hard look at my HaT Peninsular British and decided they they would not be a difficult conversion. The biggest issue was the backpack and canteen - I could find no good reference for the packs and kit these troops used, and the Osprey images, as so often is the case, stubbornly show only the front of the figure. Then I had a "Eureka" moment, finding elsewhere in the Osprey book the image below, a period illustration showing Caçadores (Voluntarios Reales do Principe, formed in 1815) as they appeared in Brazil in 1815-16. Clearly shown is the British style backpack and canteen and notes indicated that the canteen was green. Whether this was the case with the earlier Caçadores, I don't know, but I elected to move ahead basing them on this information. Caçadores in Brazil 1815-16 with British-style equipment. The only conversions were to carve the lace off the cuff, give the cuff a point, alter the shoulder tufts into wings and, as a conceit, give them all moustaches. I was happy with the results but you can judge for yourself. 6th Caçadores, 1811. 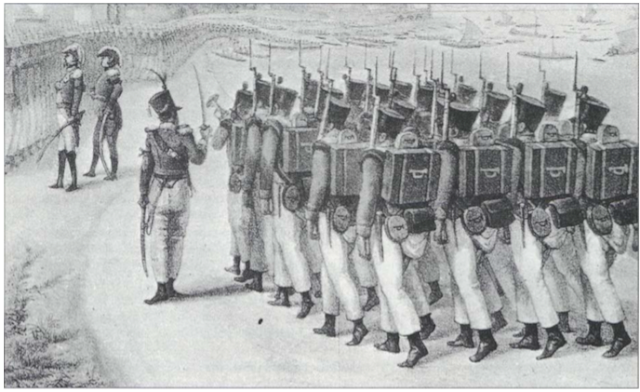 Although this image shows the soldier with an ammunition pouch at the belt, the illustration of Caçadores above and show them with strapped ammunition pouches worn British style. 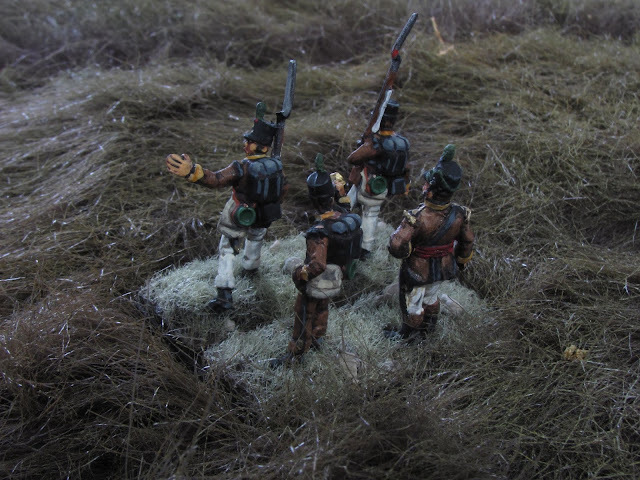 The Caçadores (Portuguese for "hunters") were established in 1808 in order to give the Portuguese army, in the process of being reorganized, a light infantry contingent. The previous light troops, The Legion of Light Troops had been disbanded in 1807 and most of the men drafted into the French Portuguese Legion. The first six battalions were authorized on October 14, 1808, with each battalion attached to a Portuguese city, as was the case with Portuguese line infantry. 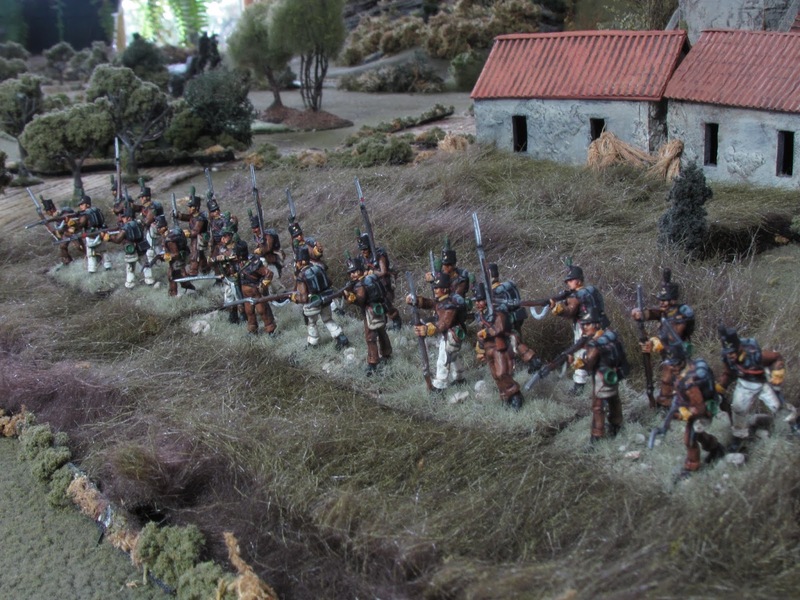 On 20 April, 1811 six more battalions were added to the Caçadores. 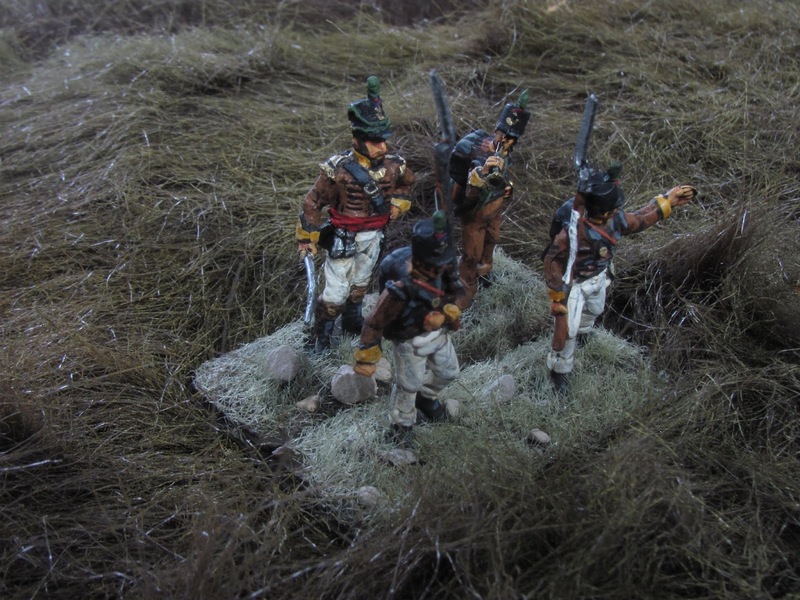 The Caçadores were trained in British light infantry tactics and over time gained a reputation as daring elite troops, fighting with distinction in Wellington's army throughout the Peninsular War. The 6th Battalion, which these figures are based on, was located at Vila Real, fought at Busaco in 1810, Fuentes d'Orno and Arroyo dos Molinos in 1811, Alamaraz and Vitoria in 1812 and Nivelle in 1813. 6th Caçadores in skirmish formation. I based these on magnetic bases so they could do double duty is stands four up and skirmishers two up. Command stand. The officer is an altered Hagen Line Infantry figure, based on the officer in the Osprey book. Caçadore stand.Conversions were adding a pointed cuff and changing shoulder tufts to wings. Thanks, Anthony. I expect blue canteens may have been the case, as those were used by the Portuguese line and much of the kit was coming from the British. 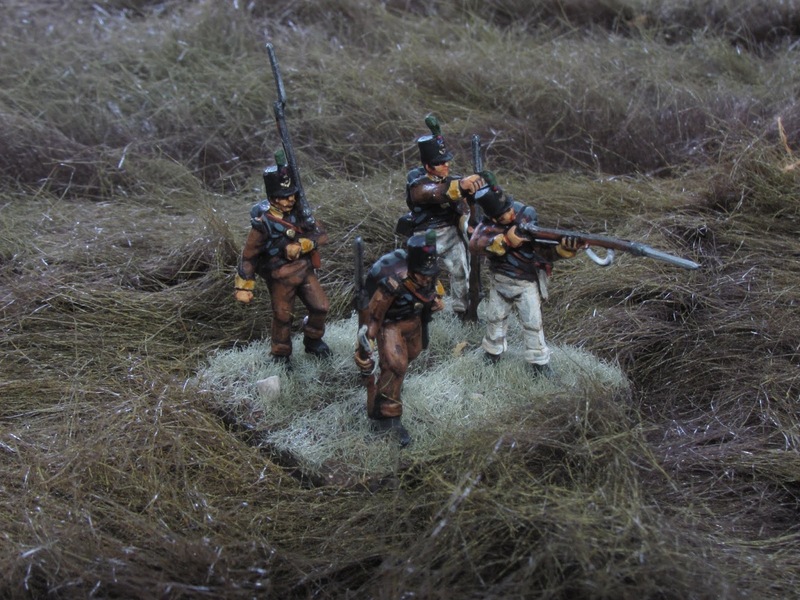 I checked out your blog - very nice painting on your figures! And I think you are right about figure size - the Portuguese were probably smaller anyway and the Caçadores the smallest of all! My Hagen Portuguese line are actually on the biggish size. Thanks. Found a graphic in one of my Portuguese books that shows the British style canteen in bare wood. Cool work, must be fun gaming these! Thanks, Remco. Yes, super fun!